The Pittenweem Arts Festival starts THIS weekend with a preview evening tonight, Friday 1st August. It continues until Sunday 10th August. You can see more details, including information on all resident and visiting artists on the Pittenweem Arts Festival website. We'll be open tonight from 7-9pm with refreshments if you want to pop along to buy or simply say hello! AND we are open 10am to 5pm EVERY DAY during the Festival. That means we will be open Sundays and Mondays! There is a special travel section on the Pittenweem Arts Festival website. Please read if you're planning a visit to the village. We are also hosting 2 workshops during the Arts Festival on Monday 4th August. Knit Together is a learn to knit workshop. The original idea for this workshop was a child and a grown up to learn together. So that the child would have access to help when they go home! But it would also be suitable for two adults to learn to together too. Learning and helping each other you will cast on, knit, cast off and sew up a hand warmer. You'll be able to finish the other one at home. This is a great way to get started in knitting and share a new craft. All materials like yarn, needles, scissors and other notions are included in the price, as well as a How to Knit guide, patterns for simple hand warmers, flowers and hat are included too. We've also included a one time use 15% discount voucher for all purchases in the shop to the end of August. This workshop fee is £25 per pair. If you're not a pair - maybe a single or a triple - give us a call. If there are spaces available we can sort something out. 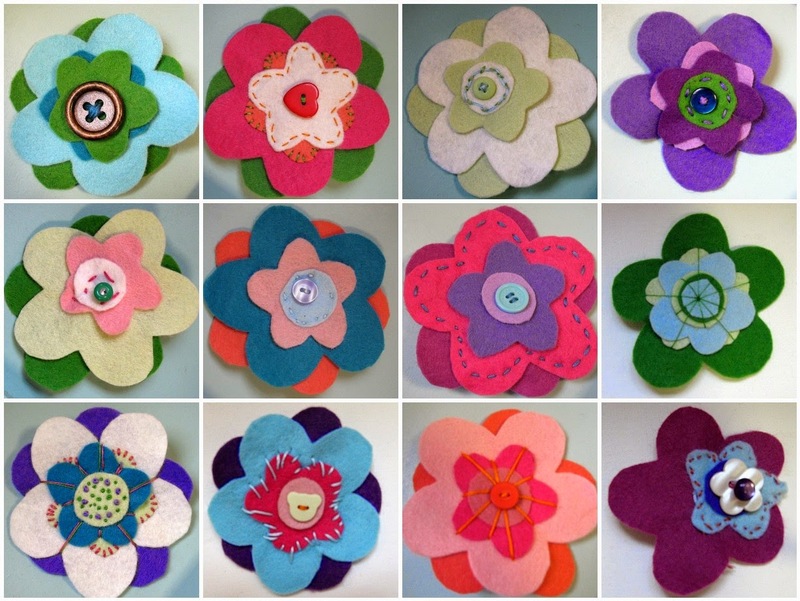 We are also hosting a Felt Flower Brooch workshop. Felt Flowers made at our last workshop! You will make a flower brooch (or two!) using our popular kit. We provide all the materials - pre cut felt, brooch bars and lots of buttons and threads. This is a great opportunity to start a little sewing and learn some embroidery stitches. As a guide, this workshop worked out great for the 8-12 age group when we last ran it. And we can tailor the class to the attendees abilities! It is £8 per ticket. Both these workshop are in the Church Hall on James Street, Pittenweem. You can buy tickets on the Arts Festival Website OR at the Arts Festival box office at 47 High Street Pittenweem (a few doors along from us). Winter Warmers is this year's Pittenweem Arts Festival project. Items made will be sold at Venue 24 - Coastline Community Church, Session Street*. Proceeds this year will be donated to Marie Curie Cancer Care and the East Neuk Food Bank. Co-ordinated by Anne-Marijke this charity project is in its 6th year! Handmade knitted and crocheted garments and accessories have been arriving at the shop and so far there are nearly 200 items. Anne-Marijke tries to thank each person personally, but in case she doesn't have your contact details - many many thanks to everyone who has taken the time to make something, you're all so generous with your time, talent and yarn! *Please note that this is a new venue!